Influenced by a few of Prof. Peter Boghossian's videos and other street epistemology videos, I've been thinking lately about Prof. Boghossian's suggestion that we focus our efforts on faith instead of religion. The more I think about it, the more inclined I am to agree with him that faith makes a superior target and that it probably does make sense to focus more on faith than on religion. In essence, our goal would shift from one of dismantling religion to one of helping people learn to base their beliefs on evidence. It may seem like a subtle shift, but it is also one which offers several potential advantages. To be clear, helping people realize that faith is an inadequate way of acquiring knowledge will almost certainly undermine religion. Placing a greater focus on faith does not mean that we give religion a pass in any way. Faith is the pillar on which religion rests, and it is apparent that religion cannot survive without it. 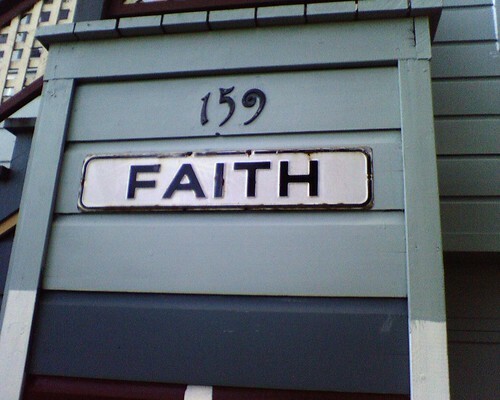 At the same time, focusing on faith seems far less likely to put the religious person in a defensive posture than directly assailing religious beliefs, practices, and traditions. The street epistemology focus on helping others consider how they know what they think they know seems like it could have many advantages here. Last December, I found myself noting how many people enjoy the trappings of religion and the many social benefits it offers. Instead of admonishing people to leave all that behind, it is probably more effective to encourage them to realize that some of what they believe is based on little to no evidence and is likely false. Over time, they may find much of the religion less appealing and discover worthwhile alternatives. Assuming that the goal many of us share is not merely one of reducing the influence of organized religion but one of improving the application of reason, critical thinking, and skepticism - not just on religious matters but across the board - it makes sense to aim at faith. If we could help our friends and neighbors replace faith with reason, their capacity for making sound decisions would be improved. They would be more rational, and this would benefit us all. Another benefit of focusing on faith rather than religion is that we would be in a much better position to recognize that there is considerable room for improvement among atheists. We have seen a number of examples over the past few years that illustrate that non-religious persons can be irrational and can fall victim to secular forms of faith. Some atheists have sought to divide the secular community on the basis of their socio-political ideology, replacing religious dogma with a secular alternative. Others seem to believe in ghosts, ancient aliens, the dangers of GMOs, or to advocate the denial of climate science. Just like religious believers, some atheists believe what they want to believe and adamantly reject disconfirming evidence. Religious belief is not required for irrationality. The refrain "But that's what I believe" can be heard among atheists too. Working to reduce the influence of religion is a worthwhile goal; however, helping people overcome faith would likely accomplish it and so much more. We could all stand to be more rational. We could all benefit from learning to embrace beliefs that are likely to be true while avoiding those likely to be false. Recognizing the perils of faith and learning how to overcome them seems like worthwhile goals.